(by Thom Patterson, CNN) — The CIA Air America helicopter bounced as it touched down on an aging apartment building in Saigon. Its pilot knew there was no room for error. Scores of South Vietnamese were lined up on that rooftop, waiting anxiously to scramble aboard his chopper. They knew 150,000 North Vietnamese communist troops were just outside the city, ready to pounce. Delicately working the controls, the pilot reduced power just enough to set down but leaving enough lift in the spinning rotor to keep much of the aircraft’s weight off the rickety roof. He held steady, while desperate men, women and children, some carrying luggage, hoisted themselves inside the vibrating aircraft. The pilot made sure they stayed clear of the deadly rotor blades while he avoided rooftop antennas that could trigger a crash. After 15 passengers squeezed into a compartment meant for nine, it was time to go. Very slowly, the pilot raised the aircraft and pointed the helicopter forward. About 40 minutes later, the evacuees landed safely aboard a U.S. Navy ship offshore. Now, imagine doing that again. And again. And again. All day long. No sleep, little food. Overbearing tension. This week marks exactly 40 years since the largest helicopter airlift in history, Operation Frequent Wind. By the time it was over, about 100 Marine, Air Force and Air America choppers had evacuated an estimated 7,000 Americans and South Vietnamese out of Saigon in under 24 hours. The airlift was prompted by some harsh realities. U.S. combat forces had been out of the war for two years after a ceasefire agreement with the North. U.S. President Richard Nixon had promised to respond with “full force” if the North violated the ceasefire. But now Nixon was powerless – forced out of office and disgraced by the Watergate scandal. 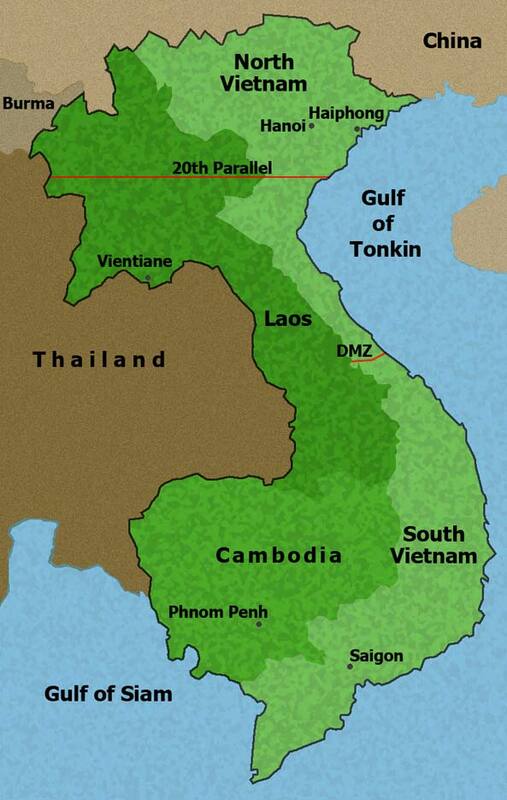 Bottom line: South Vietnam was about to lose the war. U.S. authorities faced excruciatingly difficult questions: When to leave? Who should be allowed to go? How to evacuate? No one knew how it would all play out. And the entire world was watching. Chaos ruled the city. There were fears about massive arrests, “re-education” camps and executions at the hands of the communists. Thousands of Americans and their Vietnamese family members wondered how — or even if — they were going to safely escape. The airlift was triggered by a North Vietnamese attack on Saigon’s airport, which ruined runways and made a mass airplane evacuation impossible. The only option left, planners said, was to use helicopters, which were slower and smaller than planes. The chopper option was the least desirable and the most hazardous, pilots said. That was the signal. Americans and hand-picked Vietnamese began heading toward predetermined assembly spots. Operation Frequent Wind was on. “At the time, you realized it was historic,” retired Col. Gerry Berry told CNN. Berry was then a 30-year-old U.S. Marine Corps helicopter pilot whose orders were simple: get the American ambassador out of the U.S. Embassy. But as he learned later, nothing turned out to be simple that day. Tony Coalson, 32, flew choppers for Air America, the CIA air service. Coalson was assigned the dangerous task of landing on unfamiliar rooftops throughout the city, picking up unknown evacuees and flying them to staging areas or U.S. Navy ships offshore. 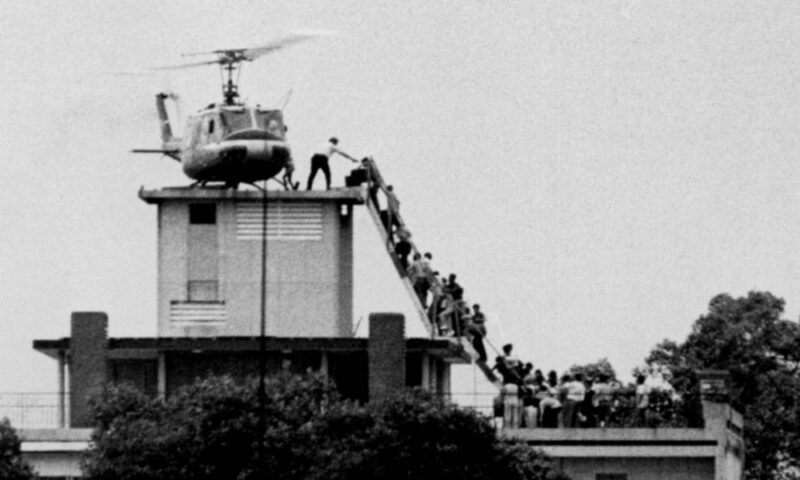 Air America pilot Robert Caron told CNN how his rooftop chopper rescue led to one of the most iconic photos of the era. And Chris Woods shared his experience as crew chief of the last U.S. chopper to leave the embassy, shutting the door on America’s involvement in Vietnam. The original plan called for most flights to arrive and depart from the U.S. Defense Attache Office, near the airport. But as word of the evacuation spread, thousands of Vietnamese began heading to the embassy compound. Soon, planners realized more choppers had to be sent to the embassy. Thick crowds jammed the gates, some holding papers claiming they had worked for the Americans. Others said they were dependents of American citizens. Many feared their U.S. connections would put them in danger under a North Vietnamese regime. Embassy Marine guards chose who to let inside. Hailing from Oxford, Alabama, this was Coalson’s second time serving in South Vietnam. He’d flown Hueys in the Army in 1967 and ’68. He’d been flying with Air America since 1970. For a lone pilot, cutting off the stream of anxious evacuees when the chopper filled up was tricky. He couldn’t leave the cockpit. And the passengers wouldn’t stop trying to get aboard. So, Coalson used his chopper to give them a hint that he was leaving. “You just slowly start to lift up, very, very slowly,” Coalson said. 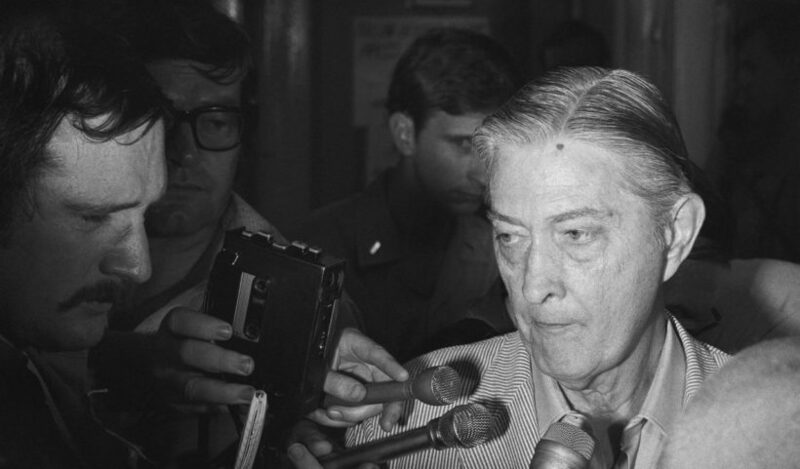 “And people knew, ‘Well, if we can’t get in, we’re certainly not gonna be able to get on, because this aircraft, I think, is takin’ off’ — which it was.” Coalson flew more than 10 hours that day without rest. Other pilots reported that some evacuees wouldn’t let go. As the choppers took off, they’d find themselves dangling from the landing skids until the pilot was able to shake them off. United Press International’s Hugh van Es photographed Caron and Hunter’s chopper perched atop Saigon’s Pittman Building, about a half-mile from the embassy. 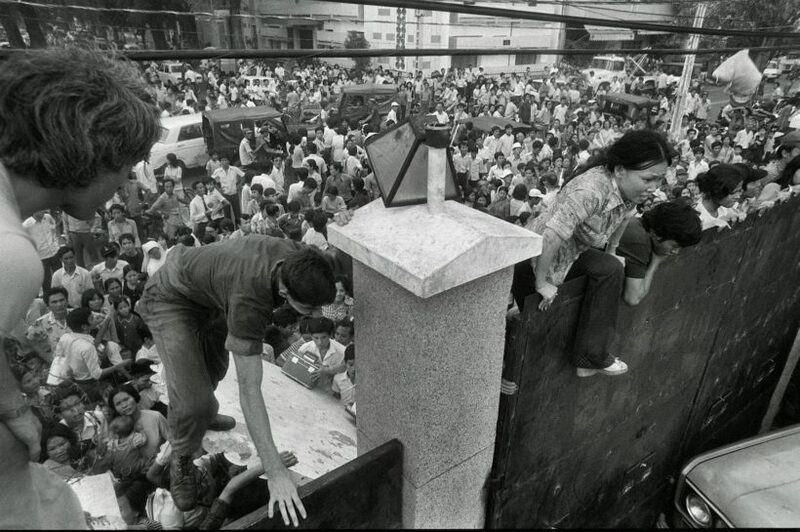 In the picture, Harnage is seen standing on the roof, helping evacuees climb a ladder to get on board. The iconic photograph has come to symbolize the chaos and desperation of that day. The Marines didn’t start their chopper airlift until the afternoon. About 65 U.S. Marine and 10 Air Force choppers took part, Berry recalled. Some helicopters shuttled evacuees from the Defense Attache Office to the Navy fleet. Other pilots, like Berry, were sent to the embassy. On April 29, at about 1 p.m., Berry’s Sea Knight — call sign Lady Ace 09 — landed behind the embassy on a special mission. “I’m here to get the ambassador,” Berry told a Marine guard. But instead of escorting the ambassador aboard, Marine guards loaded Berry’s chopper with 65 to 80 Vietnamese and other non-U.S. evacuees. Not knowing what else to do, Berry flew his passengers offshore to the USS Blue Ridge, where Navy brass were expecting the arrival of the ambassador. He didn’t know it at the time, but Berry was in for a very long day. Lady Ace 09 was just one of a swarm of U.S. helicopters that shuttled back and forth between the fleet and Saigon that day, including powerful Marine CH-53 and HH-53 Air Force choppers, which were too heavy to land on the embassy rooftop helicopter pad. Berry’s first evacuation trip led to another. Then another. “The first couple times, I always said, ‘I’m here to get the ambassador.’ ” But the attitude of the Marine guards “was like, ‘Fine. Tell somebody who cares.’ ” With each touchdown on the embassy rooftop, Berry lowered the chopper’s rear loading ramp to allow evacuees to fill the aircraft. Throughout the day, Berry watched the streets fill with residents as enemy tanks approached the city. Each time he returned to the embassy, Berry noticed more people had entered the compound. The evacuation flights didn’t seem to be reducing the crowds. And clearly they all expected to be airlifted out. He began to wonder what was keeping the ambassador. Was he waiting for orders from Washington? Or was he waiting until all the evacuees had gone? Berry said ground fire was his biggest concern. Each time Lady Ace 09 touched down on the embassy roof, it was a sitting target, surrounded by possibly armed South Vietnamese soldiers and civilians. Again the ambassador didn’t show. Berry’s Sea Knight filled with more evacuees bound for the fleet. Coalson’s final flight to the embassy provided one of his most powerful memories. “I landed on the rooftop,” Coalson recalled. “And I went down below. And they had a big office down there. And it was really surreal. … And you had the secretaries. Everybody was in kind of a jovial mood. … And that’s when — as you say — you execute your authority. And you pointed out just: “You, you, you, up on the deck. And we’re out. There were South Vietnamese pilots who engineered their own evacuations. Some of them commandeered helicopters and flew offshore to meet the American fleet. Some ditched their choppers near the Navy ships and swam the rest of the way. Many South Vietnamese choppers that were able to land on deck were pushed overboard because of a lack of space. When a huge, South Vietnamese Chinook helicopter landed aboard the aircraft carrier USS Hancock, the American sailors and Marines tried to push it over the side. It wouldn’t budge. Chris Woods – a 23-year-old Marine sergeant and helicopter crew chief – realized what the problem was. Woods remembers the terrible noise the Chinook made when it scraped the Hancock’s rear end, and fell into the ocean with a huge splash. Later that night, Woods was on deck when a Sea Knight with the call sign YT-14 crashed into the water while approaching the carrier. YT-14 was the final U.S. helicopter lost in Vietnam. The pilots, Capt. William Nystul and Lt. Michael Shea, were among the last Americans to die in the conflict. It was 4:50 a.m. April 30 aboard Lady Ace 09. Pilots were normally restricted to about six consecutive hours in the cockpit a day. But Berry was into his 17th hour of shuttling back and forth between the fleet and the embassy rooftop helicopter pad without rest. Berry landed a 14th time at the U.S. Embassy. Another load of evacuees boarded the aircraft. And once again, the ambassador wasn’t among them. That’s when Berry’s frustration hit the ceiling. Nonetheless, those magic words worked. After 18 hours, 18 minutes of nonstop flying in a war zone, Berry could finally stand down. Mission accomplished. Years later, Berry learned that a 9-year-old Vietnamese boy he evacuated that day had grown up to be a U.S. Marine chopper pilot himself. In Washington, Secretary of State Henry Kissinger announced it was over. 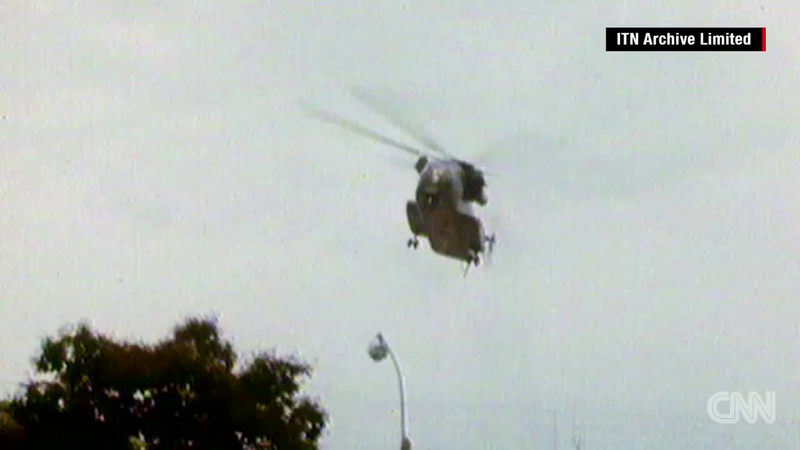 The last U.S. chopper had left the U.S. Embassy. But that wasn’t quite accurate. In fact, 11 U.S. Marines had been left on the embassy roof. Also still on the compound were 420 non-U.S. citizens who, according to the film, were promised airlifts out but instead were left behind. “We were told that Martin had left on the last helicopter and that the evacuation had ended,” Kissinger said. The Marines barricaded themselves on the roof and prepared to defend themselves against a possible attack. After sunrise, the USS Hancock sent out a final chopper to rescue the stranded Marines. The mission went to Woods and fellow crewmen of a Sea Knight with the call sign Swift 22. The chopper set down on the Embassy’s rooftop helicopter pad and Woods opened the ramp and hatch. There had been no attack. After surviving the night uninjured, all 11 Marines ran aboard. Embassy guard Master Sgt. Juan Valdez trailed last. But according to the 2011 book “Last Men Out,” by Bob Drury and Tom Clavin, Valdez almost didn’t make it. Woods said a leaky tear gas grenade on board was threatening to fill the chopper with toxic fumes. “I threw it out the window,” he said. “We lifted up 10 feet,” but then set down again so one of the pilots could put on his gas mask. With the loading ramp still lowered, the helicopter bounced as it left the roof, and then came back down, according to the book. “Valdez rolled out of the chopper … Three sets of hands shot out” to grab Valdez. But Valdez “waved them off and got to his knees” and “clambered back aboard,” taking a seat in the aircraft, Clavin and Dury wrote. Woods noticed none of that. He was standing 30 feet away in the front of the cargo hold, near the cockpit, looking for signs of enemy fire and helping the pilots stay clear of dangerous antenna and guy wires as they lifted off. “I was busy …” Woods joked. He remembers a few high fives as the chopper lifted off. One of the Marines marked the time on his watch: 7:58 a.m. April 30, 1975. The world’s largest helicopter airlift was history. The Americans had left the building. “We were gettin’ out of Dodge pretty quick,” Woods said. Swift 22 carried the embassy’s last Marine security guards to the safety of the awaiting Navy fleet. Less than three hours later, North Vietnamese tanks smashed through the gates of the Presidential Palace. Saigon would be renamed Ho Chi Minh City. After 20 years of involvement, and 58,220 U.S. military deaths, America was finally done with Vietnam. Reprinted here for educational purposes only. May not be reproduced on other websites without permission from CNN. For the original article, visit the CNN website. NOTE TO STUDENTS: This article is quite long, but well worth reading. 2. What difficult questions did U.S. authorities face when determining the details of the airlift? 3. What was the mood in the city prior to the airlift? 5. a) What were Marine Corps pilot Gerry Berry’s orders? b) Tony Coalson flew choppers for Air America, the CIA air service. What were his orders for the airlift? 6. How/why was the original airlift plan changed? 7. a) Who were the crowds trying to get into the U.S. Embassy in Saigon that day? b) Why were they afraid? 8. Why was the airlift so difficult/dangerous for the helicopter pilots? 9. a) What did some South Vietnamese pilots do? b) Why did American sailors have to push these pilots’ helicopters overboard? a) Col. Berry learned years later that a 9-year-old Vietnamese boy he evacuated that day had grown up to be a U.S. Marine chopper pilot himself. Who is that boy? Did the two ever meet? b) What did the 11 Marines left behind (who were finally rescued) think during the time they were barricaded on the roof of the embassy? Who were these 11 men? A book was written about them “Last Men Out” – can you find any news interviews with these men? c) What happened to the 420 non-U.S. citizens who, according to the 2014 documentary, were promised airlifts out but instead were left behind? Did any of them ever make it out of Vietnam later? d) Who are the “Boat People”? How many made it safely to the U.S.? Visit the Marines Association website fallofsaigon.org. Amazing details and stories of profound courage, as well as agonizing obtuseness, fill the heartbreaking documentary “Last Days of Vietnam,” Rory Kennedy’s film about America’s disgraceful withdrawal from Vietnam and the heroics of its final hours, told largely via interviews with men who were there – including the very last embassy guard to board the last helicopter. After the 1974 resignation of Richard Nixon, who had personally guaranteed a forceful response if the North Vietnamese invaded South Vietnam following the 1973 cease-fire agreed by the Paris Peace Accords, the communists were emboldened to rip through the South in 1975. They intended to conquer the country by the date of their dead leader Ho Chi Minh’s birthday – May 19. The speed of their advance was astonishing, the threat they posed repeatedly denied by the tragic figure at the center here, late Ambassador Graham Martin. Martin is a kind of King Priam of this tale, a man who merits his own major Hollywood film. He had lost his only son in the conflict and was in denial until the moment he drove out to the Saigon airport to see that it had been destroyed by North Vietnamese shelling. And yet such was the man’s sense of honor that when the helicopter arrived at the embassy for him, he refused to board: He sent hundreds of Vietnamese to safety first, in a hastily improvised American airlift so noble and inspiring that it amounts to the one great uplifting tale to emerge from our hideously bungled sojourn to Southeast Asia. That the story has largely gone untold is a shame, and Kennedy (daughter of Sen. Robert F. Kennedy) has done a service to the country in reminding us. As woeful as the end was, the grit of men and women scrambling desperately for freedom ahead of death and/or torture at the hands of the communists makes for a testament to human determination.